Recycling bins sit curbside on South 17th Street in the Graduate Hospital neighborhood of Philadelphia. What can and cannot be recycled by the Philadelphia Streets Department's recycling program? We have the answers. It’s time we sorted through Philadelphia’s recycling rules. 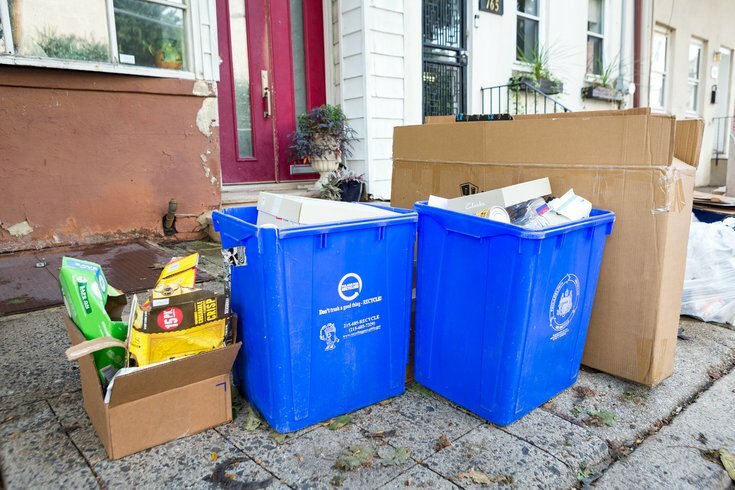 On trash day, there’s always a myriad of things in those cracked, un-lidded blue recycling bins — paper coffee cups, pizza boxes, beer cans, cardboard moving boxes, bits of plastic, scraps of paper. And there are always things that get left behind. I set out on a quest to learn more about the confusing, complicated and finicky system that is recycling in Philly. 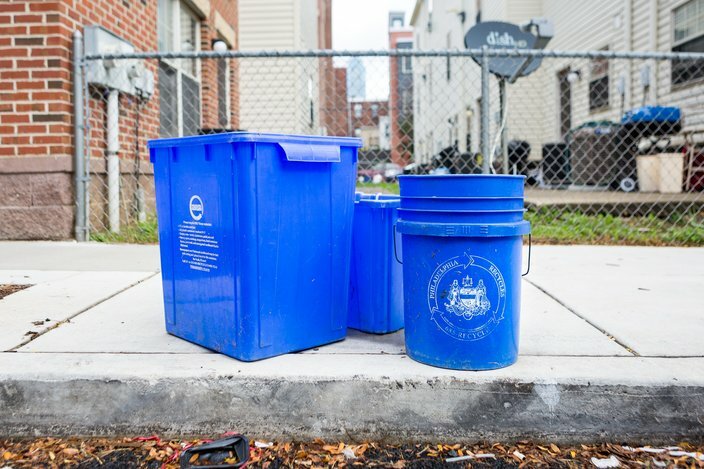 It turns out that the recycling habits of Philadelphians are, as the Streets Department’s Environmental Director Scott McGrath puts it, a bit overzealous. Philly’s recycling process starts with trucks that come the same day as regular trash pick-up in a process called “single stream” recycling, which means everything is collected at one time instead of paper on Monday, cans on Tuesday, and so on. Everything is hauled to the Republic Services facility in Grays Ferry, where it’s sorted, bailed into bricks and loaded on trucks. Those bricks are shipped to mills around the U.S. and overseas that actually do the recycling. Each item is sent to different places; and recyclables like paper and cardboard may be sent to three or four processors that turn those specific materials over for a profit. McGrath said most items made of metal, plastic, cardboard, wood, glass, and paper can technically be recycled — but that doesn’t mean he wants them on your curb once a week. The business of recycling has dictated the industry in recent years, McGrath said. Things like technology and contamination hold collectors back from taking everything we put out. On its website, the Streets Department has a list of things residents can and cannot recycle. But that list brought me to these specific, calculated, crowd-sourced questions. I hope it helps you sort it all out. As a kid, I was always taught to unscrew caps from bottles before they were recycled. On your website, it says lids are recyclable. Has that always been the case? I think that is something that has evolved within the industry over time. Yes, the caps are recyclable. They are just a different kind of plastic. Keep them on the bottle or keep them in your recycling loose. It doesn’t matter either way, they can be processed. Should we wash out jars and plastic containers that once contained food? And why? Yes. The food is a contaminant. It is more so today than, say, even two or three years ago. The market has gotten really, really fussy about any kind of contamination with the materials that are being collected. If people leave a lot of food in a container, it gets crushed in the compactor truck and then that food will contaminate perfectly good paper that is in the truck. The less food that is in there, the better. The cleaner the material, the better. But how clean is clean? Are we talkin’ a cold-water rinse or hot-water-sponge scrub? You just need to rinse it out. We know we can’t recycle greasy pizza boxes. Can we rip off the top of the used pizza boxes to recycle? Why can’t we recycle boxes with grease on them in the first place? The paper plants do not want any food or grease, period. It’s a processing issue. Anything that contaminates the fibers, there’s a problem. Even if they get too wet, the fibers degrade. Speaking of water … Should we leave papers and cardboards outside to be collected if it’s going to rain that day? And if they get wet from the rain, will they still be collected? We’ll collect them and our processor will attempt to recycle them. Ideally, and one thing we’re starting to do now, we’ll have lids available for bins. We’re starting to move toward encouraging people to use lidded containers to solve that problem because yes, when it rains a lot of the fibers degrade when they get wet. The paper becomes mushy, for lack of a better word, and it makes it difficult for the equipment to separate it. But we don’t want people to worry about it. We still want people to put it out. So was that a big problem this year with all the rain we got? Yes, it has been. In fact this whole summer it has been a problem. It has been absolutely incredible. It has created some issues from a processing standpoint. What happens to that mushy paper if it can’t be recycled? They try to separate it if they can. The worst case is … that gets landfilled. How should we properly dispose of needles and syringes? You can put them in a hard-sided container, in fact it could even be something like a detergent container with a top that you can screw on and put it in with the trash. That’s a very common question. You don’t want that in recycling because it could injure workers at plants themselves, and that has become an issue. They still do some manual sorting at the recycling plants. On your website it says we can’t recycle styrofoam. That seems weird. Why? There’s no market for it. Technically it can be recycled. One of the biggest problems is transporting it. You’re just transporting air. No one can come up with a solution for transporting. Recycling plants … use the geometry and weight density and other physical characteristics of the containers to separate them. And styrofoam, just because of its nature that it comes in all shapes and sizes … [are] not designed to separate stuff like that out. OK, rapid fire: Paper cups, clear plastic cups, red solo cups, washed plastic cutlery — what can we and can’t we recycle? The cups cannot be recycled. There’s no market for cups. Part of that is a market issue, and part of that has to do with chemistry, the chemistry of how they make the cups. It makes it very difficult. Even if the cup is a No. 1 or No. 2 type of plastic, because of what they do to make that cup, they can’t deconstruct it or make it into a pellet form again. It has to do with chemistry and manufacturing process to make the cup. Cutlery, we don’t want that. For the same reason as cups. The recycling plants can’t because of the shape and size, it’s just junk. It ends up in the bottom (of the processor) with all of the miscellaneous stuff that can’t be separated. Even if you wanted to recycle cutlery, you couldn’t because you can’t separate it out. Technically, yes. In a practical matter, it’s difficult. But yeah, if people have a busted up bin that can be recycled. Are small pieces of paper like clothing tags worth recycling? No. Shredded paper and little bits is just too difficult for them to separate that out. Has anything ever slipped into the recycling center that shouldn’t be there? Can you remember anything crazy? What was it? Another thing people will try to put in recycling are things like mop handles and plywood because they think wood is recyclable. Technically it is, but not in that system. Another item are things like extension cords and garden hoses. They’re plastic, so people think that can go in. But they get wrapped up in the equipment. About a year ago, one of the workers at a plant where we go had his hand severely injured because they tried to grab a garden hose and his hand got stuck in the conveyor belt. Those kinds of things can cause real injury. We can't recycle plastic bags, right? If we can’t, how can we properly dispose of them? No, plastic bags tear and wrap around the processing machines and systems. If you really want to get them recycled, a lot of the grocery stores have containers for them. ... If you have enough of them, they do have some value. We can use any kind of bin, as long as it’s marked 'RECYCLING,' right? Exactly. You don’t have to use a city-issued recycling bin. Paper takeout containers, if they're washed? I would say no to that. It's the type of paper that is difficult. They have to make sure it doesn't get stuck in with the cardboard. Some types of paper are really hard for them to separate out properly. What are the most common items placed on the curb that can't be recycled? Cassette tapes. They end up in there all the time. Just because there is a recycling symbol on something (Example A: Most plastic bags), doesn't mean it should be recycled. Used paper towels and napkins cannot be recycled (i.e., contamination). Light bulbs, porcelain and non-container glass, and electronics cannot be recycled at the curb. For some items like electronics, mattresses, yard waste, and Christmas trees — which are technically recyclable but cannot be picked up on the curb — the Streets Department provides Sanitation Convenience Centers. Here's more. The Streets Department hosts Household Hazardous Waste Events throughout the year. Here are the 2018 drop-off dates. Examples of household hazardous waste: Paint thinner, varnish, pesticides, drain cleaners, oven cleaners, aerosol cans, kerosene, Compact Fluorescent Lights. If you run a business in Philly, here are the recycling guidelines.